" Articles from: August 2010	"
This November, after all that we've learned over so many years, twenty percent of the nation will still engage in blind-faith voting on DREs that are 100% unverifiable, with or without a so-called "Voter Verifiable Paper Audit Trail" (VVPAT). Elsewhere, the vast majority of Americans will feed paper ballots into easily hacked optical scan systems and then quietly accept the results that the machines spew out without demanding a hand count of the paper ballots. The corporate media will dutifully publish the reported "results" without so much as mentioning that in most jurisdictions not a single ballot will have been counted by a human being. With Brad Friedman and Desi Doyen off enjoying some much needed R & R, I thought some levity was in order, courtesy of this hilarious, if somewhat dated, Onion video. UPDATE FROM BRAD 9/6/10: Now that I'm almost back on the grid, a quick addition here to note that we ran this same video back on February 25, 2008. That it still has resonance and meaning today --- after all that we've learned about the 100% unverifiable nature of such systems --- says a great deal, since we're still foolishly using these things all across the country, as Ernie pointed out. Also related from The Onion, as we ran in November of 2008, there's this: "Sequoia Touch-Screen Elected 44th President". 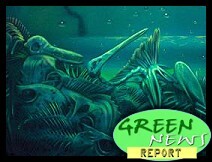 'Green News Report' - Gone Fishin'! As we noted in last Thursday's report, the Green News Report will be away until after Labor Day, as we enjoy our first week off EVER from the GNR since we began broadcasting in 2009! On Saturday, Arthur S. Brisbane, the New York Times' new Public Editor, filed his debut column. He takes his difficult post following the reign of the former Public Editor Clark Hoyt, the disastrous 'weasel' (cartoonist Tom Tomorrow's infamous depiction, not ours, though we have no quibble) whose contract ended last June. In the first column of his new thankless role, Brisbane mentions among others, as part of his description of the Times' "substantial infrastructure for responding to public complaints," Senior Editor/Standards Greg Brock. 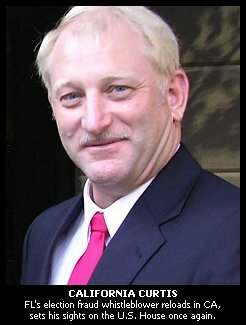 Readers of The BRAD BLOG will remember Brock for helping to kick off what became a 70-some part series here on the "paper of record's" horrendously damaging and inaccurate coverage of Andrew Breitbart, James O'Keefe, and Hannah Giles' ACORN "Pimp" Hoax. 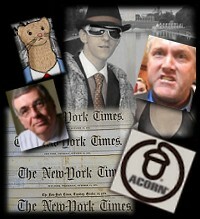 Brock, as some of you will recall, had responded to a reader's request for correction on a number of stories in which the Times had misreported that O'Keefe had dressed as, and represented himself as a "pimp" in the offices of ACORN, even though, as we reported repeatedly beginning early this year, he never had, as first based on the information in the independent report that had come out several months earlier from former Massachusetts Attorney General, Scott Harshbarger. Though the paper had reported on the "pimp" scam in a number of articles, they had never so much as even mentioned the Harshbarger report [PDF] which accurately stated that O'Keefe never dressed in the "outlandish" outfit the Times (and other media outlets) had reported him as wearing while interviewing ACORN workers. Worse, the paper continued to misreport that point long after Harshbarger had disabused the world of that notion, by noting clearly that "at each and every" ACORN office visited by O'Keefe with his partner Hannah Giles (who was dressed as a "prostitute") he was "dressed like a college student - in slacks and a button down shirt" and even though ACORN had stated on the record, based on interviews with their employees who were there, that "O'Keefe was not wearting that absurd costume when he visited our offices." Aside from a story I wrote over the weekend, which will be waiting for you to enjoy on Monday morning here, Ernie will be largely holding down the fort here on his own, for the first time, unless another Guest Blogger or two jumps in while I'm gone. So please be nice to him, each other, everyone else and yourselves until I'm back --- at which time you can go back to being mean to everybody again. Katrina 5 Years Later: Have We Learned Anything? 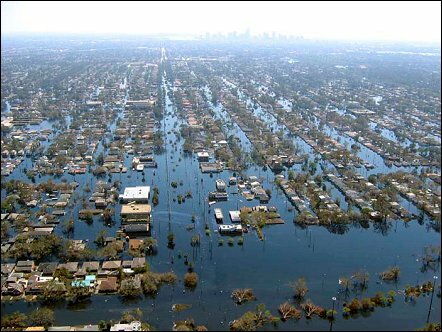 Today marks the 5th anniversary of Hurricane Katrina slamming into the Gulf Coast at New Orleans, Louisiana, on August 29th, 2005. What the Category 3 hurricane did not destroy, the man-made disaster finished off, drowning much of the beloved city, killing over 1800 people, and displacing over a million more, many permanently. Dr. Martin Luther King, "I Have a Dream"
Article Categories: Rights And Freedoms, MLK, Jr.
First, we didn't do it. 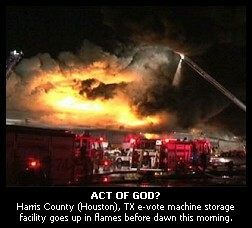 HOUSTON – A three-alarm fire swept through a northeast Houston warehouse early Friday wiping out more than 10,000 pieces of voting equipment. City officials said they are unsure what will be done when voting begins in the next few months. The Harris County Election Technology Center, located on Canino at Downey, caught fire around 4:20 a.m., and the blaze quickly grew to three alarms. The warehouse stored more than 10,000 pieces of equipment, including voting booths and eSlates, the computer-based machines used for collecting votes. The fire comes just months before the general elections on November 2, which include the governor’s race. Early voting is scheduled to begin in October. Former KPFT (Houston Pacifica) radio host and election integrity advocate Pokey Anderson tells us there are some 1.8 million registered voters in Harris County, the third largest in the nation. "Harris County is huge," she writes via email this morning, "est. pop for 2006 is 3.6 million people, which is larger than the population of 23 states. That is about the size of Iowa and Vermont combined." KTRH NewsRadio reports County Clerk Beverly Kaufman is hoping to "depend on other counties around the state, even across the country, to donate similar machines." Until God tried to intervene this morning, Harris County used 100% unverifiable Direct Recording Electronic (DRE) voting systems made by Austin-based Hart Intercivic. A source familiar with Hart Intercivic tells The BRAD BLOG that the nation's fourth-largest e-voting company has fallen on hard times of late and does not have machines to ship to replace those lost in the fire. If they can't get "similar machines" from somewhere, how, oh, how will the citizens of Houston be able to have elections this year?! Especially since pieces of paper, pens, eyeballs, citizen oversight and common frickin' sense were all long ago outlawed in Harris County, Texas, apparently. Also related: This year's Harris County Pac-Man Tournament has been canceled. While barreling westward across the Great Plains yesterday, I received an urgent text message from Bev Harris of the non-partisan election integrity watchdog organization BlackBoxVoting.org. She and Susan Pynchon, an election integrity advocate from Florida Fair Elections Coalition, had traveled to Shelby County (Memphis), Tennessee, following reports of massive voter disenfranchisement during the state's August 5th elections. She and Pynchon have been in the county, on behalf of a number of the candidates affected by the apparent disaster for the last two weeks. "Wildest election tampering yet in memphis," Harris' detailed text message read. "7 out of eight candidates black in black locations with 70 percent dems but white republican sweep." "Ten candidates filed lawsuit today," the message continued, as she explained that over the past two weeks she and Pynchon "watched as [election officials] wheeled cartloads of computers out of the building. 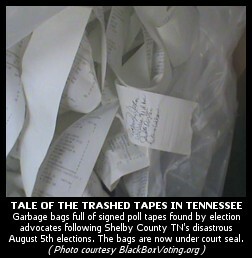 Thousands and thousands of votes don't add up...poll tapes in trash and much more." 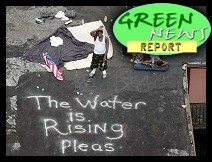 IN TODAY'S RADIO REPORT: Aid slowly reaches Pakistan as historic flooding continues; Plastic Bag Wars in California; Another BP employee pleads the 5th; Those hungry, hungry microbes ... PLUS: The 5th Anniversary of the Drowning of New Orleans ... All that and more in today's Green News Report! Californians have been drawn within the cross-hairs of a propaganda blitz bought and paid for by Meg Whitman, the billionaire former CEO of eBay, who, since declaring her intent to run for governor in February, 2009, has already contributed $59 million of her own money to her "campaign" --- a one-sided political phenomenon which has seen a stealth candidate, with disturbing connections to Goldman Sachs, soar to the top of the polls because the electoral process has been emasculated by the absence of mandatory debates and meaningful investigative journalism. 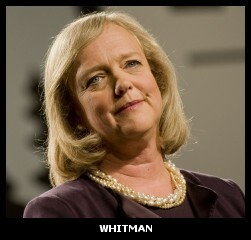 Apparently Whitman now feels that campaigning exclusively by way of paid-for propaganda (political ads) will not be enough to evade scrutiny of her economic "plan" to "rescue" California's economy (a rehash of Bush tax cuts for wealthy people and business, the elimination of climate change regulations and imposition of further draconian spending cuts to a state government already operating on life support --- a plan which a group of economists, including Stanford University's Kenneth Arrow, a Nobel laureate, have derided as policies which would "deepen California's budget crisis and are likely to reduce employment and economic growth"). I may have more to say on this later, but short on time at the moment, and since it's an older thread you may not be checking it on your own. So, for now, I'll just point you towards his comment (and mine which follows it) in reply to my recent piece on hacking Pac-Man onto a Sequoia/Dominion AVC Edge touch-screen voting machine. 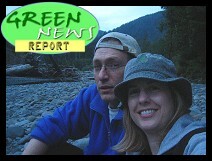 We were on the road all day long yesterday, after getting the morning's Green News Report. We finally got off the road and back on the grid as the sun was setting here in the Midwest, and as "results" began coming in from some of the five different states (Alaska, Arizona, Florida, Oklahoma and Vermont) holding primary elections last night. It seemed a good moment to ask a question on Twitter about what we'd missed so far. 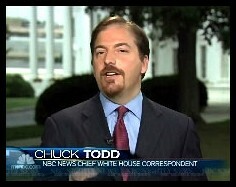 In the bargain, we received some interesting Twitter replies from NBC's Chief White House Correspondent and election results guy Chuck Todd, in regard to counting ballots and the fact that he (and others) were busy reporting "results" to the world, even as not one single ballot had yet to be counted by any human being in all of the United States by that point. IN TODAY'S RADIO REPORT: Egg-gregious egg recall gets egg-spanded (sorry); "Gulf Dead Zone" gets egg-spanded, too, as thousands of dead fish turn up, and oil continues to come ashore, as the Obama Administration gets slammed for low-balling oil spill estimates ... PLUS: The World's Longest Traffic Jam --- 10 days! And you thought your commute was bad ... All that and more in today's Green News Report!